The election for the 2014-2015 NPMA Board of Directors will be held this spring, and, for the first time, NPMA will be offering online voting. To ensure you have the opportunity to vote, please make sure we have your proper email. Contact Jessica Dominguez at jdominguez@pestworld.org if you need to update your information. Join us for a webinar on March 5, 2014 at 1 p.m. EST. This webinar, featuring panelists from the EPA, CDC, Connecticut Agricultural Experiment Station and NPMA, will cover pertinent topics including conventional and non-conventional tick management practices, landscape management, EPA resources for tick management and PPE and health implications relating to tick management. ACE certification can lead to better visibility, more opportunities and jobs! 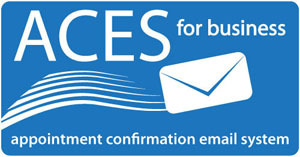 Visit the roster of other ACEs in your area — www.entocert.org/roster. Demonstrate your knowledge. Become certified today. Visit www.entocert.org for details. The ACE program is managed by the Entomological Society of America and endorsed by the National Pest Management Association. Click here to view a list of services and pricing. Click here to get started today! The Hawaii House of Representatives is considering a non-binding resolution requesting that the state Department of Agriculture apply to the U.S. Environmental Protection Agency for a special local needs registration for OvoControl, a bait containing nicarbazin, to control feral chickens within the State of Hawaii. Click here to read the House Concurrent Resolution 54 and related information. The Oklahoma House of Representatives last week passed legislation requiring persons performing commercial nuisance wildlife control services to pass a Department of Wildlife Conservation-administered nuisance wildlife control operator certification examination and obtain a nuisance wildlife control operator permit from the Department. Similar legislation passed the House last year but was overwhelmingly defeated in the Senate. Click here to read House Bill 2618 and related information. The Connecticut General Assembly this week will begin considering legislation establishing the rights and responsibilities of landlords and tenants in managing bed bug infestations in multifamily housing. Under House Bill 5438, landlords would be required to have a qualified inspector inspect the unit suspected of being infested and any contiguous unit within five days of being alerted by a tenant of a possible infestation. The measure defines a "qualified inspector" as "a certified applicator, local health department official or bed bug detection team retained by a landlord to conduct an inspection for an infestation of bed bugs." The legislation also requires bed bug detection teams to hold a current, independent, third-party certification in accordance with the National Pest Management Association's Minimum Standards for Canine Bed Bug Detection Team Certification. A similar bill almost won approval from the General Assembly last year. Click here to read HB 5438 and related information. The sponsor of a Maryland bill classifying all neonicotinoid pesticides as restricted use pesticides recently withdrew the measure from further consideration. This action come on the heels of the defeat of a Maine bill banning the use and sale of neonicotinoid pesticides. Click here to read more about the Maryland measure. A bill prohibiting the use of second generation anti-coagulants rodenticides brodifacoum, bromadiolone, difenacoum and difethialone in environmentally sensitive areas was recently introduced in the California Legislature. Under Assembly Bill 2657, "environmentally sensitive area" includes any wetlands, animal sanctuary, conservancy, state or national park, and any area or habitat that is protected for any endangered or threatened species, including animals, birds, fish, and insects. Click here to read the measure. Another bill recently filed in the California Legislature would require the Department of Pesticide Regulation to develop a training program to train any person who plans to apply pesticides on a school site, and would require the training program to cover the safe use of pesticides and integrated pest management. Click here to read Senate Bill 1405. A bill modeled after the District of Columbia's Wildlife Protection Act that limits methods wildlife control operators can use to manage problem wildlife and requires efforts to preserve animals in family units is pending in the New York Assembly. Click here to read Assembly Bill 8329. Legislation was introduced in the New Jersey Legislature last week requiring hospitals, nursing homes, assisted living facilities, hotels and homeless shelters to have an agreement for bedbug eradication services with a certified commercial pesticide applicator. Click here to read Senate Bill 1610. Smiles were a little brighter for many Illinois children last Christmas due to efforts by the Illinois Pest Control Association (IPCA) vendor pool and the generosity of IPCA members. 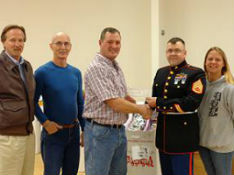 On Dec. 6, 2013, representatives of the IPCA presented a check in the amount of $1267 to the Toys for Tots Foundation, administered locally by the United States Marine Corps Reserve, Company C, 6th Engineer Support Bn in Peoria, Ill. The proceeds were the result of "silent auction" bids and cash donations at IPCA spring and fall conferences. 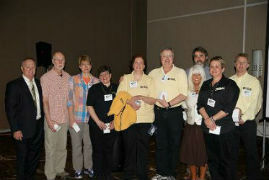 Critter Control recently held its 30th annual convention at the Sheraton New Orleans and recognized 20 and 25 year franchise anniversaries. Stuart Aust, President and CEO of Bug Doctor Termite and Pest Control, recently announced the promotion of Timothy Periard to Vice President of Operations. Tim joined the company in 2009 as the Branch Manager and in his new position will oversee the operations of all five divisions of the company. Reynolds Pest Management Inc. is proud to announce their recent award through Angie's List — the Super Service Award for pest control, termite control and lawn care. This specific award is the highest ranked award presented to only to a very few select superior companies with outstanding reviews. Less than 5 percent of businesses listed on Angie's List will ever be awarded with the Super Service Award. The award was presented to Reynolds Pest Management for the services categorized in Pest Control and Pest Control Exterminating, said Angie's List founder Angie Hicks. Reynolds Pest Management serves the Vero Beach area, St Lucie County, Martin County Palm Beach, Broward and North Dade County for all pest control needs, whether they are an Angie's List member or not. William C. Schendel, member of NPMA and the Iowa Pest Control Association, passed away at the age of 88 on Saturday, February 22, 2014 at the Marshalltown Medical & Surgical Center in Marshalltown. Online condolences may be sent to www.andersonfhs.com. March 9-11, 2014 Legislative Day 2014 Washington, D.C.
You will receive free fabric samples, a testing report, special pricing sheet, and more.